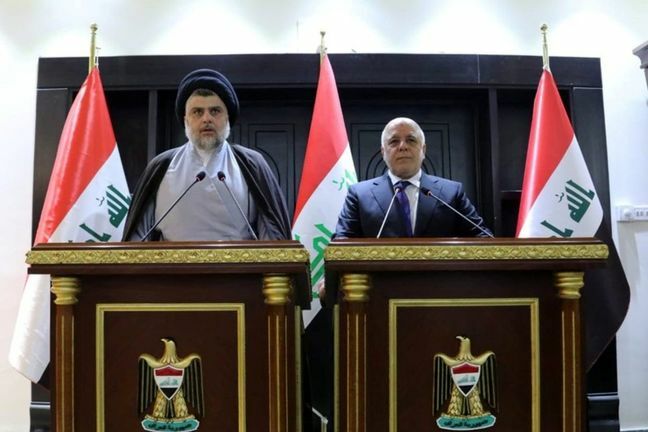 EghtesadOnline: Iraqi Prime Minister Haider al-Abadi met with Moqtada al-Sadr on Saturday, less than 24 hours after the Shi’ite cleric’s bloc was declared winner of Iraq’s parliamentary election, the clearest sign yet they could work together to form a coalition. “During our meeting, we agreed to work together and with other parties to expedite the process of forming a new Iraqi government,” Abadi said at a joint press conference. Sadr, a long-time adversary of the United States who also opposes Iranian influence in Iraq, cannot become prime minister because he did not run in the election, Reuters reported. However, his bloc’s victory puts him in a position to have a strong say in negotiations. His Sairoon electoral list captured 54 parliamentary seats, 12 more than Abadi’s. “Our door is open to anyone as long as they want to build the nation, and that it be an Iraqi decision,” Sadr said. A bloc led by Hadi al-Amiri, one of the most powerful figures in Iraq, came in second. Amiri, who leads an umbrella of paramilitary groups, has maintained close ties with Iran for decades. Before the election, Tehran publicly stated it would not allow Sadr’s bloc to govern close ally Iraq, with which it shares a border. Iran has influenced the choice for prime minister in the past. Winning the largest number of seats does not automatically guarantee that Sadr will be able to hand-pick a prime minister. Parties will have to align themselves to try and form a bloc large enough for the parliamentary majority necessary to nominate a candidate. The government should be formed within 90 days of the official results, but negotiations are expected to drag on for months. The election dealt a blow to Abadi, but he could still emerge as a compromise candidate palatable to all sides because he has managed the competing interests of the United States and Iran - unwitting allies in the war against Islamic State - during his term in office. In recent days, Sadr also met with Ammar al-Hakim, whose Hikma Movement trailed in seventh place, as well as with ambassadors from Iraq’s neighboring countries including Saudi Arabia, Tehran’s main rival in the Middle East.